Description: This tutorial teaches FIWARE users about how to create and manage context data subscriptions. The tutorial builds on the entities and Stock Management Frontend application created in the previous example to enable users to understand the NGSI Subscribe/Notify paradigm and how to use NGSI subscriptions within their own code. The tutorial refers to Stock Management actions made within the browser combined with cUrl commands. The cUrl commands are also available as Postman documentation. 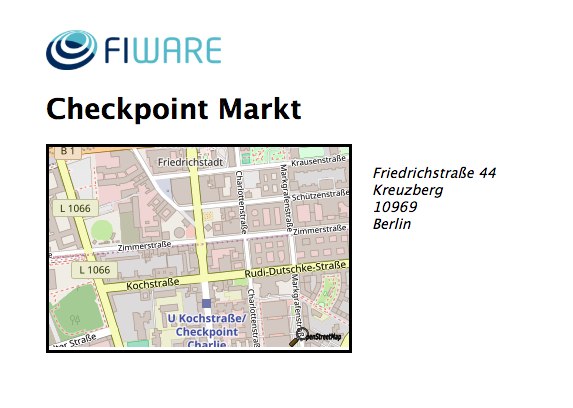 Within the FIWARE platform, an entity represents the state of a physical or conceptual object which exists in the real world. Every smart solution needs to know the current state of these object at any given moment in time. The context of each of these entities is constantly changing. For example, within the stock management example, the context will change as new stores open up, products are sold, prices change and so on. For a smart solution based on IoT sensor data, this issue is even more pressing as the system will constantly be reacting to changes in the real world. Until now all the operations we have used to change the state of the system have been synchronous - changes have been made by directly by a user or application and they have been informed of the result. 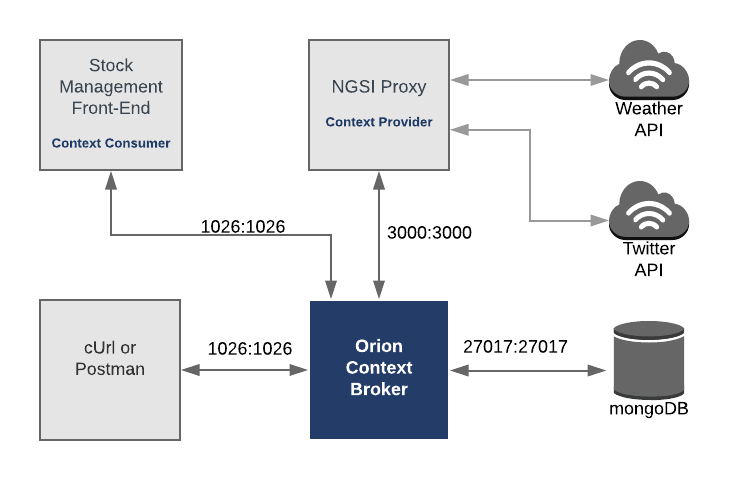 The Orion Context Broker offers also an asynchronous notification mechanism - applications can subscribe to changes of context information so that they can be informed when something happens. This means the application does not need to continuously poll or repeat query requests. Use of the subscription mechanism will therefore reduce both the volume of requests and amount of data being passed between components within the system. This reduction in network traffic will improve the overall responsiveness. To follow the tutorial correctly please ensure you have the follow pages available on tabs in your browser before you enter any cUrl commands. Within the stock management example, imagine that the regional manager of the company wants to alter the price of a product. 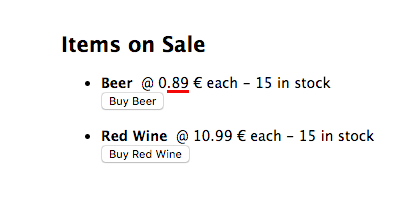 The new price should immediately be reflected at the till in all stores within the system. It would be possible to set up the system so that it was constantly polling for new information, however prices are not changed very frequently so this would be a waste of resources and create a lot of unnecessary data traffic. The body of the POST request consists of two parts, the subject section of the request (consisting of entities and conditions)states that the subscription will be fired whenever the price attribute of any Product entity is altered. 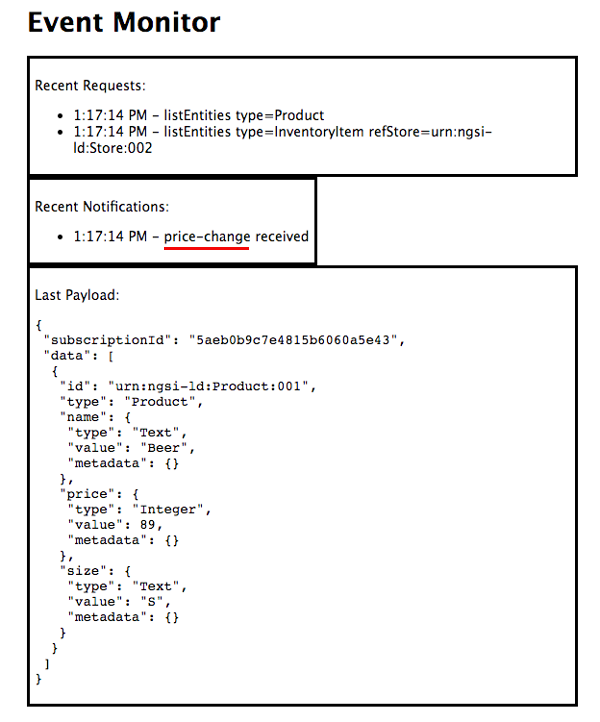 The notification section of the body states that once the conditions of the subscription have been met, a POST request containing all affected Product entities will be sent to the URL http://tutorial:3000/subscription/price-change which is handled by the stock management frontend application. With the previous example the full verbose data from each affected Product entity was sent with the POST notification. This is not very efficient. 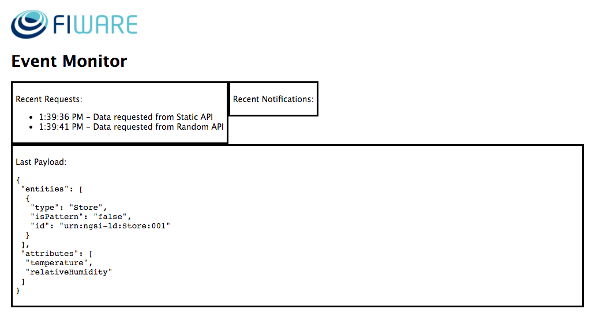 The attrsFormat attribute specifies how the entities are represented in notifications. A verbose response is returned by default keyValues and values work in the same manner as a v2/entities GET request. Lets create two more subscriptions which will only fire under specific conditions - and will only return key-value pairs for the entity affected. Imagine that the warehouse of each store now wants to be informed whenever the amount of product on the shelf falls below a threshold level. 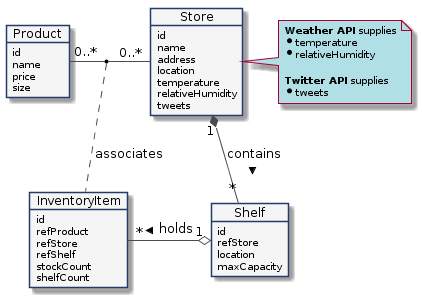 The subscription is tested whenever the shelfCount of an InventoryItem is updated, however the addition of an expression attribute will mean that the subscription will only fire if the expression returns valid data - for example "q": "shelfCount<10;refStore==urn:ngsi-ld:Store:001 tests that the shelfCount is below ten and that the item is in store 001. 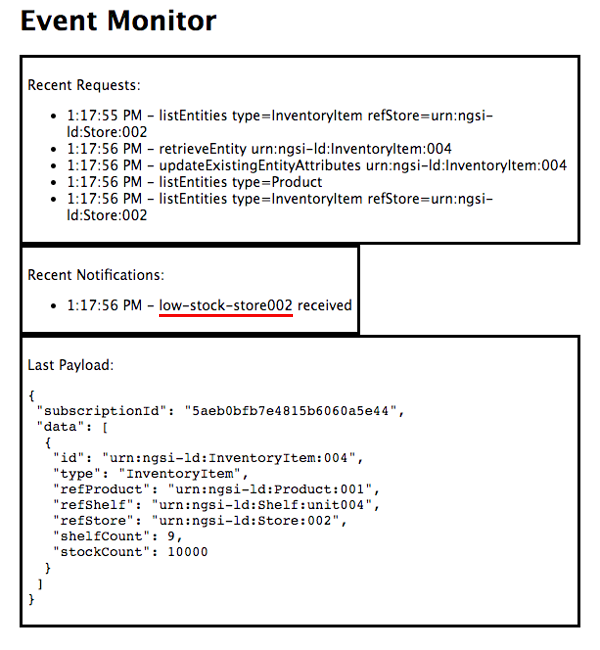 This means that we can set up our business logic so that other stores wont be bothered by notifications. The two requests are very similar. It is merely the url and the expression attributes which differ. The first cUrl command will only fire if the affected InventoryItem entity has a reference to Store 001 and the second one if the affected InventoryItem entity has a reference to Store 002. Obviously the URLs must be different so that the business logic of our application is able to react differently to each request. As you can see the key-value pairs of the affected InventoryItem have been passed to the Stock Management frontend. An alert has been raised by the business logic within the application. The CRUD operations for subscriptions map on to the expected HTTP verbs under the /v2/subscriptions/ endpoint. The <subscription-id> is auto generated when the subscription is created and returned in Header of the POST response to be used by the other operation thereafter. This example creates a new subscription. 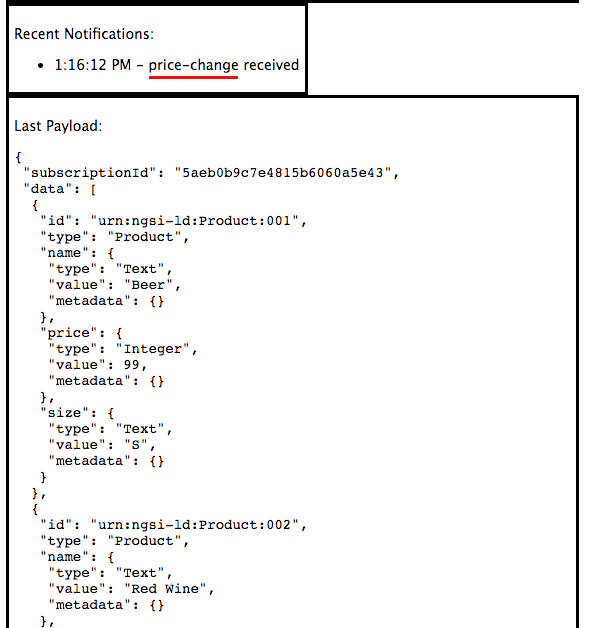 The subscription will fire an asynchronous notification to a URL whenever the context is changed and the conditions of the subscription - Any Changes to Product prices - are met. New subscriptions can be added by making a POST request to the /v2/subscriptions/ endpoint. The subject section of the request states that the subscription will be fired whenever the price attribute of any Product entity is altered. The notification section of the body states that a POST request containing all affected entities will be sent to the http://tutorial:3000/subscription/price-change endpoint. This example deletes the Subscription with id=5ae079b86e4f353c5163c939 from the context. Subscriptions can be deleted by making a DELETE request to the /v2/subscriptions/<subscription-id> endpoint. This example amends an existing subscription with the ID 5ae07c7e6e4f353c5163c93e and updates the notification URL. Subscriptions can be updated making a PATCH request to the /v2/subscriptions/<subscription-id> endpoint. This example lists all subscriptions by making a GET request to the /v2/subscriptions/ endpoint. The notification section of each subscription will also include the last time the conditions of the subscription were met, and whether associated the POST action was successful. This example obtains the full details of a subscription with a given ID. The response includes additional details in the notification section showing the last time the conditions of the subscription were met, and whether associated the POST action was successful. Subscription details can be read by making a GET request to the /v2/subscriptions/<subscription-id> endpoint.